Here is the long winded story leading up to this whole thing. It's boring so you might want to skip it and just jump to the pics. I hadn't really planned this but now I've got it so here we go. A buddy of mine went to an estate sale and bought a lake house. 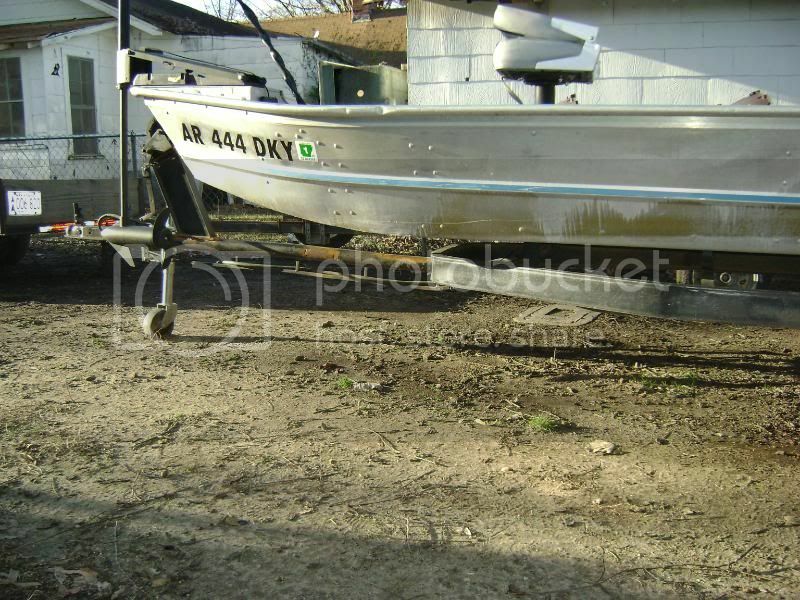 Included in the deal was this 1977 model 1538 Fisher Marine Water Rover. I told him I might be interested in it so he told me to take it home. 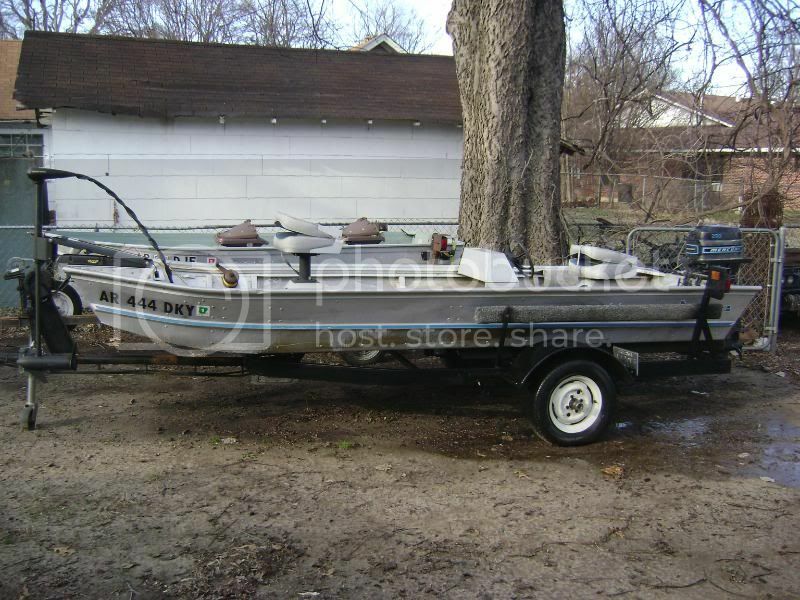 It has a 75 model 20hp Mercury with electric start and a 40# Minn Kota trolling motor. Neither of which was working and the outboard was mostly in pieces in the back of the boat. I decided to tackle the trolling motor first, figuring the outboard was probably a basket case. After some initial testing, I found that there was no power getting through the foot control. I pulled it all apart and cleaned all the contacts and wire connectors. Everything tested good with my meter so I put it all back together. Yeah!!! I've got a fully functional trolling motor now. The mount for the trolling motor had the top ripped off, and they had stacked some 2x's in between the aluminum side plates and run wood screws through everything. I removed all of that and after some deliberation set about trying to fab something up. I ended up using some 1/8" aluminum plate to make a new top and back for the mount and got it mounted. On to the outboard. I tried to find a factory service manual but couldn't located one so I grabbed a Seloc manual from Ebay. It was a tiller model that had been converted to remote. 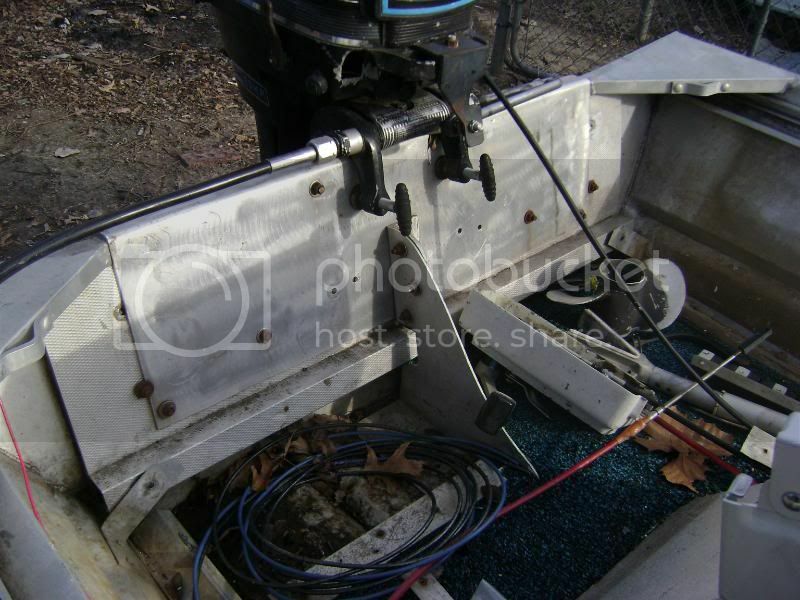 The previous owner, in his haste to convert it, cut the tiller mount bracket off with a hack saw. It was already in pieces and I didn't know how long it had been sitting, so I pulled the carb and fuel pump. I was surprised to find they looked pretty good inside, but I cleaned a little on them any ways and reinstalled them. The starter motor was hanging by it's power cable, so I pulled it off and tested it. It was working so I lubed the bendix and reinstalled it, only to find out the solenoid was bad. After installing a new solenoid it was working fine. At this point, I decided I could test the compression even if it was on a cold motor. 105 on both cylinders so I was in luck there. The insulation on the internal wiring harness was cracking pretty bad and new ones are $175 +, so I rebuilt that. The recoil starter was hanging up and wouldn't recoil. I pulled it apart and after a lot of cleaning and some lubrication, got it working good. After figuring out how to reassemble and adjust all of the remote throttle linkage, I decided it was time to throw some new plugs in it and see where I was. It fired up after several attempts, and after some adjusting here and there, I've got it starting on 2nd pull with a cold motor. At this point I decided it was a keeper. I go back out to my buddy's house and tell him I'm keeping it and ask him how much he wants. As it turns out, he's been eyeballing a deer rifle of mine, and that it would be a good trade. Done and Done! 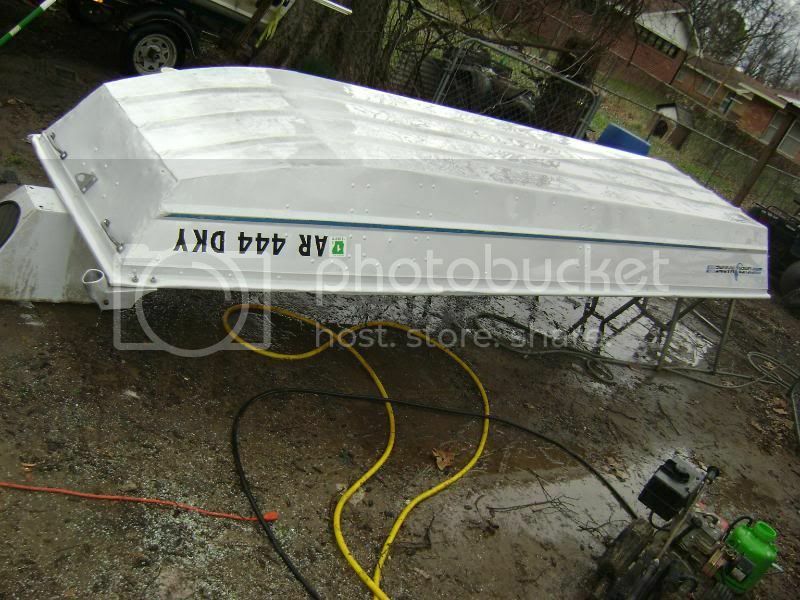 Now I'm anxious to get it in the water to see how the motor preforms, but more importantly, see what sort of shape the boat is in as far as leaks or any other problems. I got the boat registered to make it legal and took it to the river. It's a little slow getting up on plane and will only make 21mph but it's a start. During my testing I decide to go WOT at the start and discover I mostly likely have a spun hub. Now I know why there was an extra prop laying in the boat. If you've made it this far in my long winded first post about this boat, it's time for some show and tell. 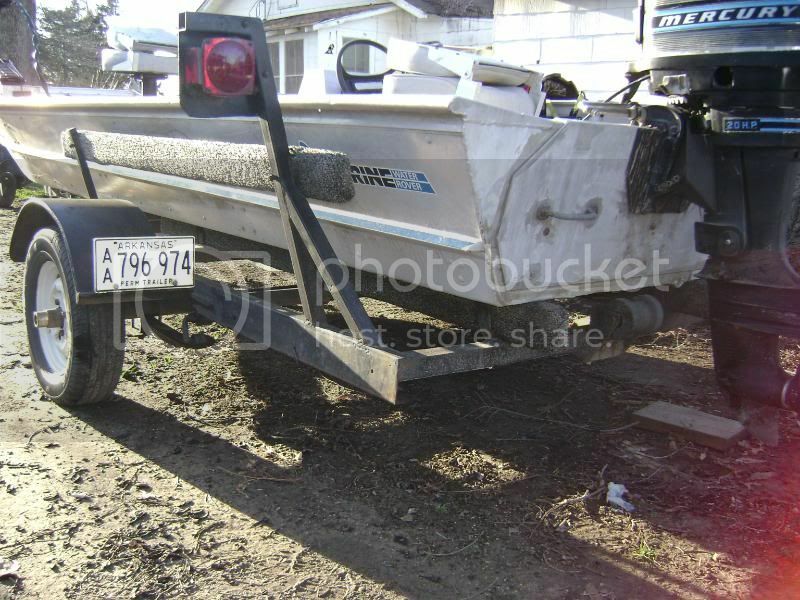 Here is the trailer than came with the boat, that now has my 12' Gamefisher sitting on it. 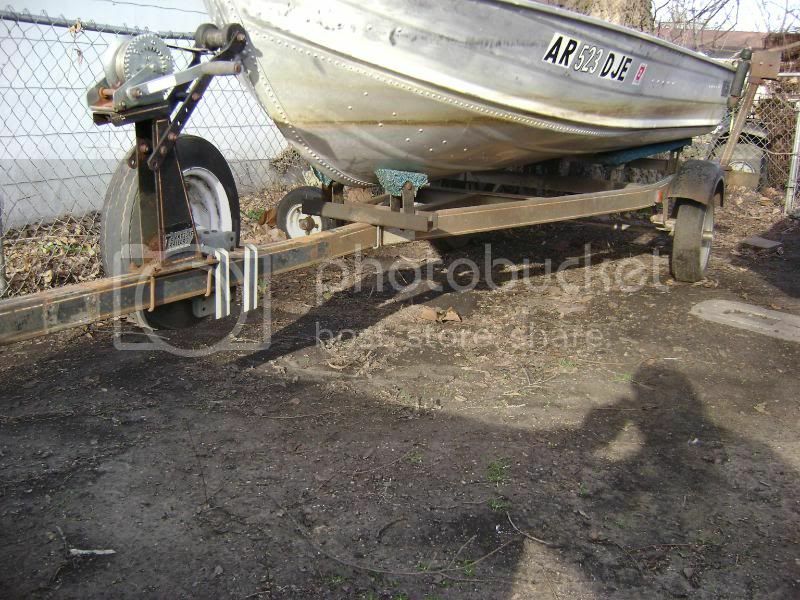 The boat is pretty heavy so I went on the hunt for another trailer. I found this for $60. 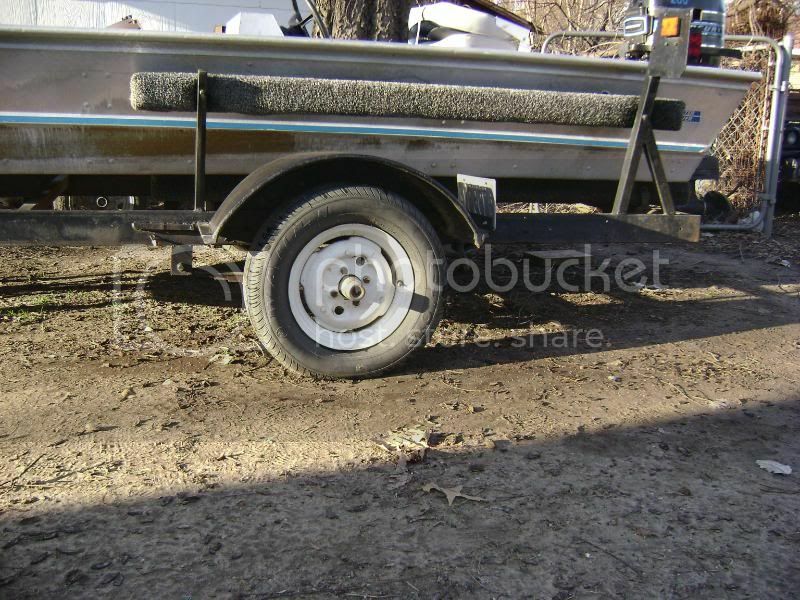 Put new tires on it and relocated the winch farther forward and have a few other things to do to finish the trailer. Here is the overall view as it sits right now. I'll post more pics of the interior and what my plans are in a little while. Last edited by JMichael on 23 Oct 2014, 10:47, edited 9 times in total. 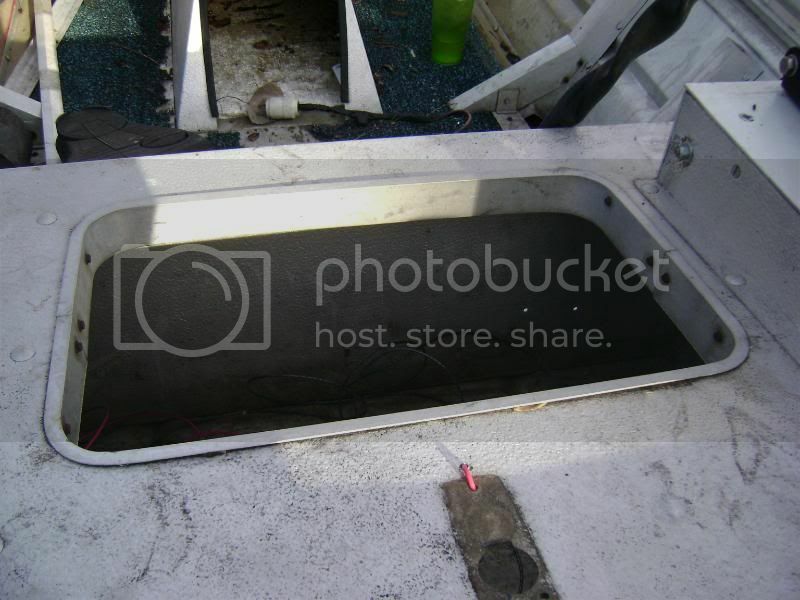 My cavitation plate sits ¾" below the bottom of the boat so I was thinking about raising the motor 1". Here is a look at the transom. The transom is wrapped inside and out by 2 pieces of 3/16" aluminum plate that are welded together at the top to make a single piece. I was thinking I could pull out all the bolts (I'm replacing them with stainless anyways), and plug all the old holes. Then put a piece of 1" cypress between the wrap and the top of the transom and bolt it all back together. I think it would be strong enough but I'm open to other ideas on this if you have one. I'd like to turn the front storage compartment into a battery box for my trolling battery. I've been looking through the build threads for an idea on how to fab a lid for this compartment since whatever was there originally is gone. 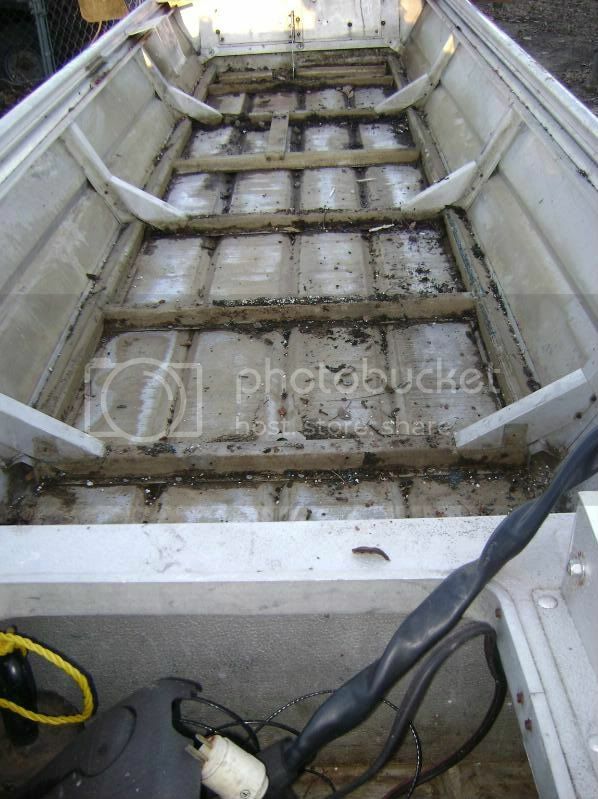 I'd like it to be flush when closed and able to support my weight if I step on it getting in/out of the boat. 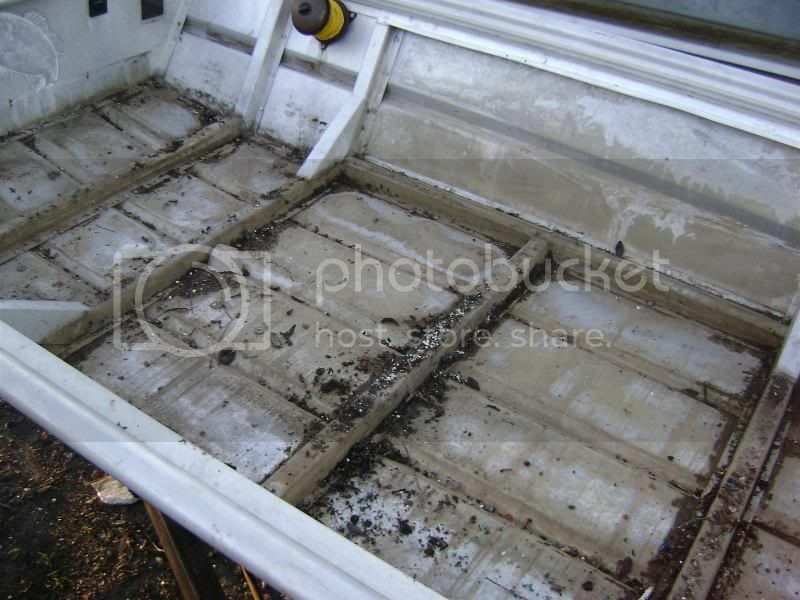 I've stripped the side panels and foam out and the floor is next. I mainly fish for crappie, bream, and catfish. The bream fishing has me running under a lot of low hanging limbs, so I've talked myself out of raised decks and higher seats. The conversion to remote controls was done using "creative thinking" . I've been trying to find factory parts in order to do this properly but haven't had any luck so far. I did pick up a replacement tiller and mount bracket the other day just in case. The more I think about it, I'm tempted to just pull the remote stuff out and put it back as a tiller control motor. That would give me more useable floor space and eliminate some weight. I'm also trying to figure out a good way to eliminate those wide seat bases and go to the same style that all you bass fishermen are using but I haven't figured out how I would mount the base plate securely. Well that's all for now, I'm going to prowl around the other build threads looking for ideas on how to accomplish some of this stuff. Last edited by JMichael on 24 Jan 2012, 19:34, edited 1 time in total. I didn't get to work on it very long today, but it was a learning experience. 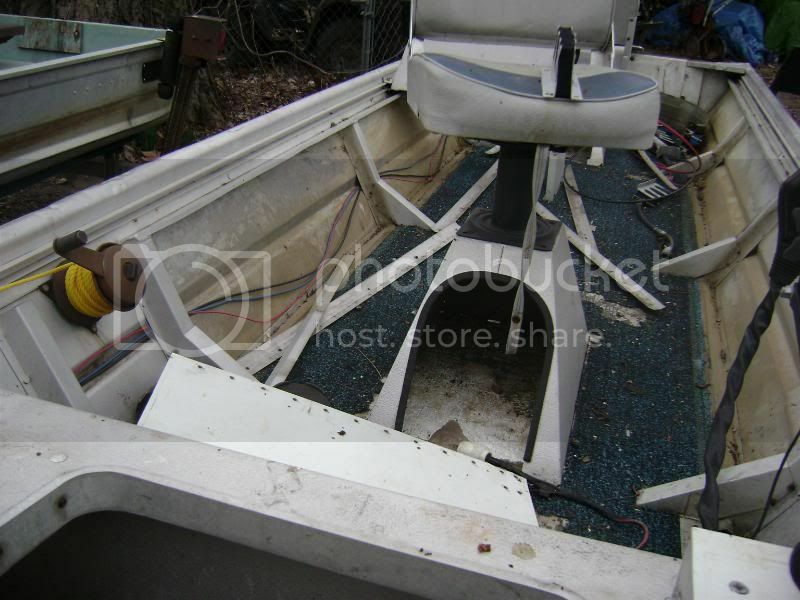 I removed the motor, remote controls, console, seats, wiring, and all the floor. 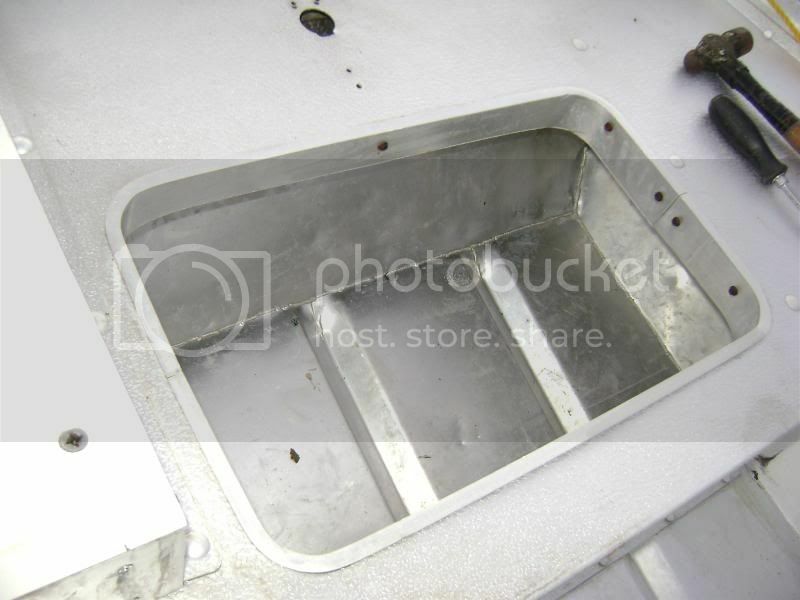 Fisher marine evidently didn't know what stainless was when they put this floor in. 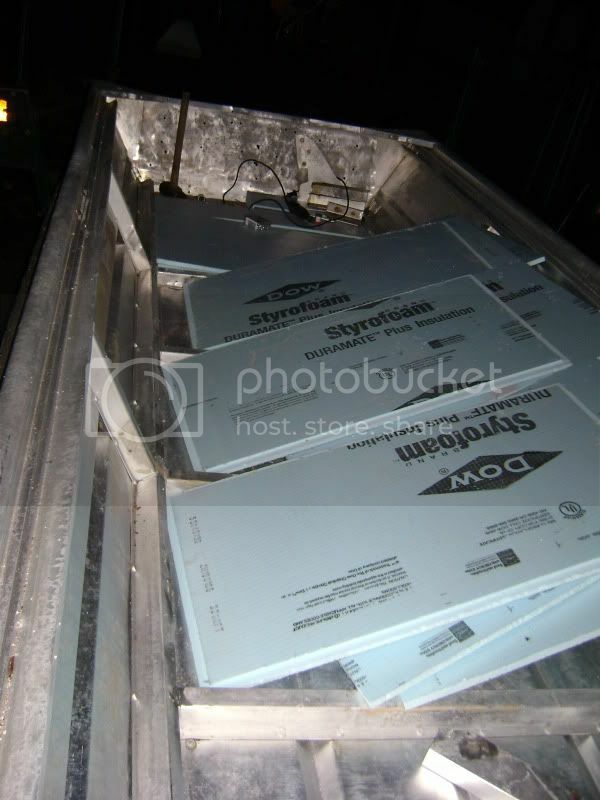 It was a real challenge to remove all of those steel sheet metal screws with the ¼" heads. I think I might have invented at least three new cuss words in the process. The biggest surprise for today was when I started to remove the foam. As I lifted the first piece out, I couldn't believe how much it weighed. It was so water logged it was unbelievable. Out of curiosity, I decided to get an estimate of the weight. I weighed an 18x20x¾" piece, that came in at 5.8 lbs. 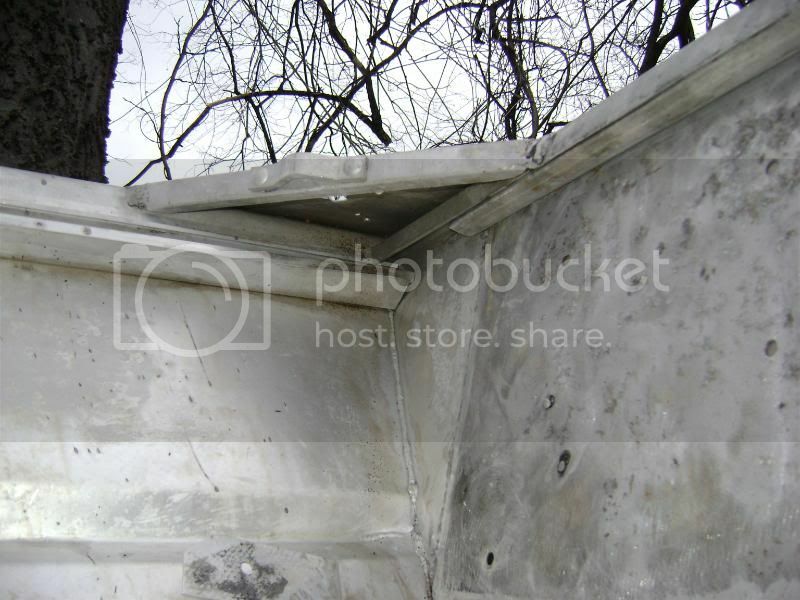 It was double layered from the back edge of the front deck, to the transom. If my math is correct, that's around 185 lbs. 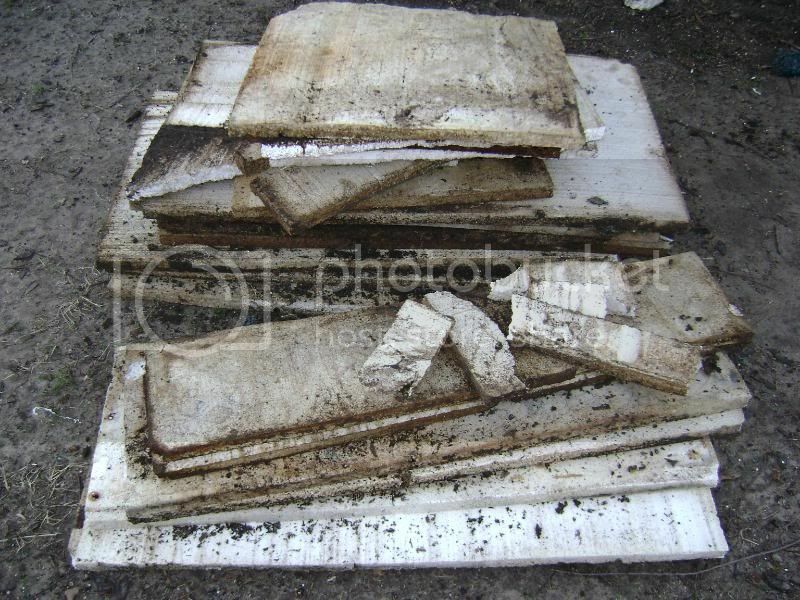 So a conservative estimate would be around 160 lbs of soggy foam. No wonder the boat didn't run as fast as I expected on my test run. Next step will be to remove the trolling motor, get the pressure washer out of hibernation, and give it a good cleaning. Going to check on aluminum angle availability and pricing today and was wondering what you'd estimate the linear footage to be. If you've done a mod that included a front deck around 4 feet front to back let me know about how much aluminum you used. I'm just double checking my math really so ball park numbers would be fine. After 2.5 days of non stop rain, we finally got a day of sunshine. It took me the best part of the afternoon to locate a source for my aluminum but I finally found it. I picked up 75 feet of 6061-T6 angle for just under $1 per foot. It might not be enough to complete the job but should be enough to do most of it. 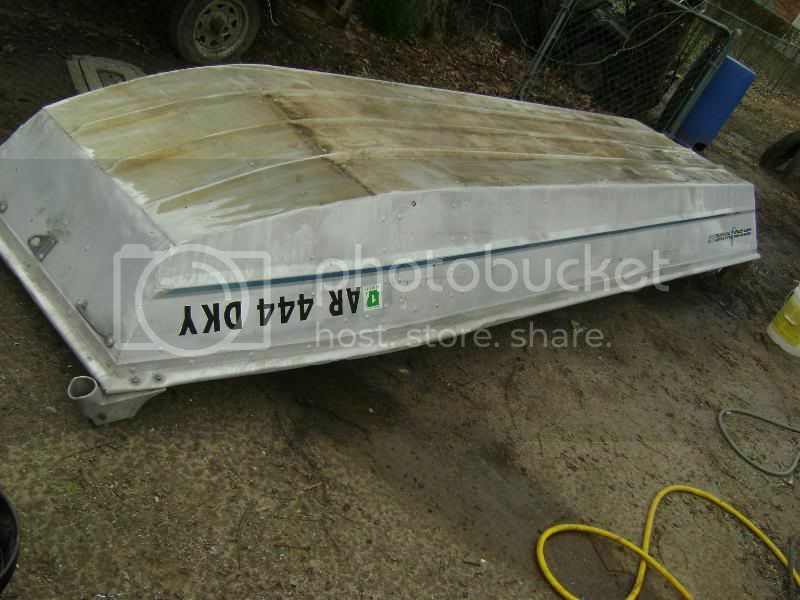 I plan to clean the inside tomorrow and see about raising the transom an 1 inch. Since I'm restricted to working outside in the elements, this is going to be a drawn out process. Gave the boat a bath so I'm not getting filthy while I work on it. It cleaned up pretty good. Started the transom tear out and discovered I don't have a metal blade for my jig saw. Next I pulled the angle braces that join the ribs. These braces were put on with small sheet metal screw but some had vibrated out and others had the head about rusted off so they were tough to get out. Is there any reason that I shouldn't put them back on with rivets? Also did some measuring and planning on trailer mods. Doesn't sound like a lot of work but getting that heavy duty wrap they had on the transom off took some time. They had about a dozen rusted up bolts going through it and the thing was glued to the transom skin with silicone. Last edited by Jdholmes on 28 Jan 2012, 23:37, edited 1 time in total. I replaced mine with those same sheet metal screws. I went and bought stainless (1 size bigger than origianl since some were a little bored out) Mine were same as yours, I had some that had the heads almost totally rusted off but it took 35 years to get to that point and almost none of the surrounding metal was rusted. So I just went the same route. Also my boat is kept in the garage so I wasn't too worried about it. I definately don't see any issue riveting them back in though. Should be plenty strong. I was glad to get the transom done. It was a a decent amount of work but I feel good knowing that all the metal behind that wood is sanded and repainted now and I replaced all the hardware with stainless with 5200 also. I was lucky my boat had been kept in a boathouse for all of those years or would've been much worse. Jonmac, did you remove your knee brace in order to replace your transom? If you did, what did you use to put it back in? 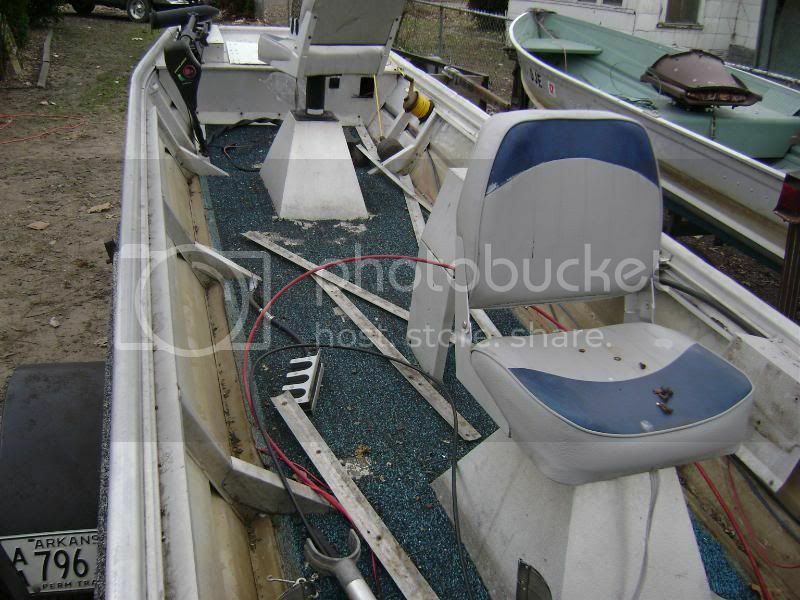 Yours looks identical to mine except mine has some of that textured aluminum like your side panels over the inside of the transom. I did not remove mine. I was able to bend it out of the way. (with a come-a-long) I used 2 pieces of plywood, after I treated them I put them back in separately and then glued them together once they were in. It was tight and a little painful but to me it was better than taking out the kneee brace or cutting the top of the transom. Once I bent the knee brace back and bolted it to the transom, I was able to straighten it back out with a rubber mallet. 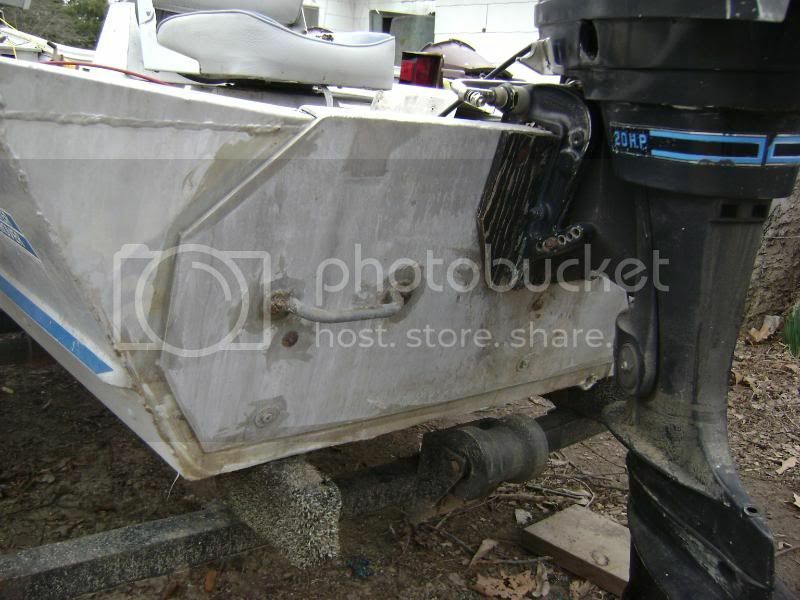 Got the grinder out and removed the anchor mate (factory installed with rivets) and the transom knee brace. Wire brushed the transom real well and discovered a lot of pitting (some bad enough to put pin holes in the transom). Picked up my foam and got it all cut and test fitted. Now I'm going to be at the mercy of the welder, waiting to get my transom welded up. 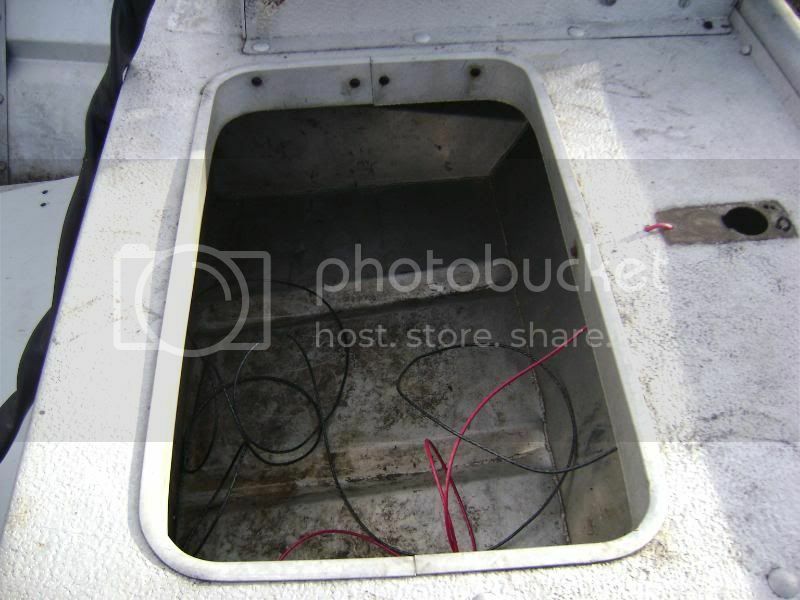 The transom has about 2 dozen bolt and screw holes as well as the several pitting holes. It's also cracked at the top on both sides where it's welded to the gussets. What a mess. So the weather has taken a turn for the worse around here and since I'm limited to working on my boat outdoors, it's limited the amount I could do. 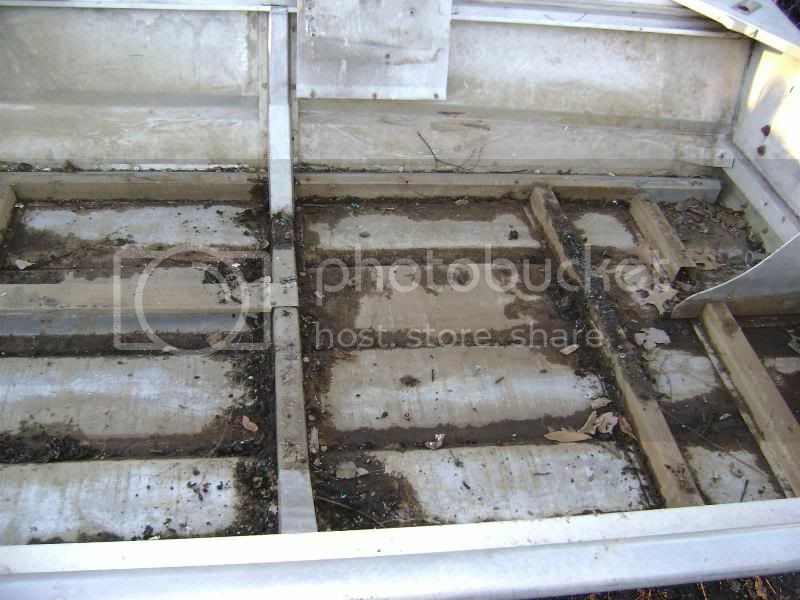 I decided to get the boat to the welder and see what he could do about the 30 some odd bolt/screw holes in my transom as well as all the pin holes from the pitting. 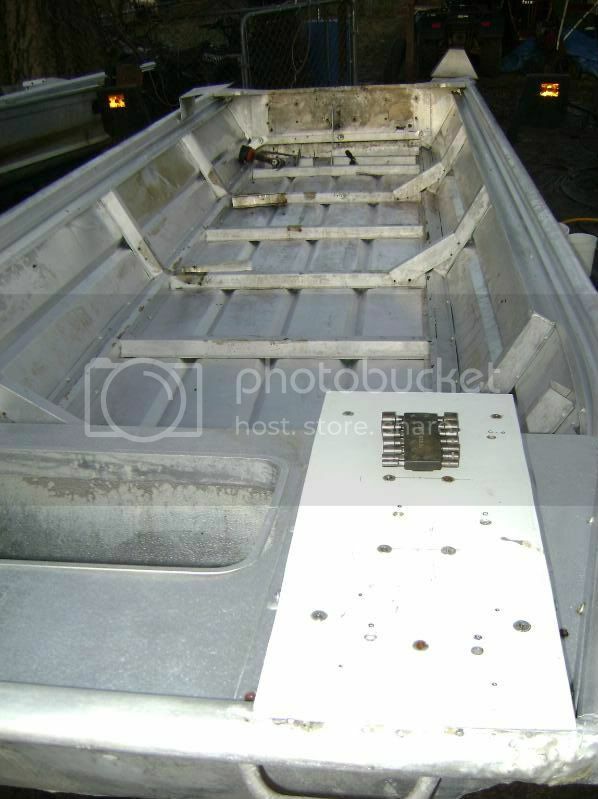 He took one look at the transom and said it would take him 2 days worth of welding to close up all the holes. It turns out that he had a piece of scrap 1/8" aluminum plate laying around so we decided to put that on the outside of the transom. Next he took a piece of 3/16 thick, 1" square tubing and welded it up under the lip at the top of the transom where the wood normally runs. It's not the prettiest repair job ever done but I think it's stronger now than the day it rolled out of the factory and should last a lot longer than the original. And I'm definitely not going to complain since I handed him a 30 pack of bud light and drove away with my boat. That part fit well within the limits of my budget build. After getting it home and doing a quick leak test to make sure it was water tight, I decided to work on cleaning the exterior. I did some quick experimenting with alumabrite to water mix ratios, then started to work. It turned out that the humid overcast day worked in my favor and I didn't have to worry about the alumabrite drying on me. Here is the before and after shots, which was about 45 minutes worth of work with the mop/alumabrite and pressure washer. That was the end of any half decent weather for being outside working for any length of time so I turned my attention to my motor. I've torn the motor down to the power head and all it's major components. After degrease and steam cleaning on all the parts, I feathered all of the chipped paint areas on the exterior, water sanded and got the primer on. Now I'm just waiting on the humidity level to drop and the temps to rise so I can get the motor painted and start the assembly. I've picked up all the wood for my front deck, transom, and the 2x4 for building new trailer bunks. I'll start cutting and sealing the transom and bunk pieces in the next few days I hope.